The lost spiritual discipline of simplicity. I have just dropped off at the train station 2 of the most adventurous people I know. They go on walks. At months at a time. Covering thousands of miles. As they walk they meet people, share good news and see what happens. On some of their walks they wait to be invited into people’s homes. In three months they slept out only 10 or so times, the rest they were invited into homes to share the news of Jesus and to simply be with people. These past few days I have felt God speak to me about simplicity. 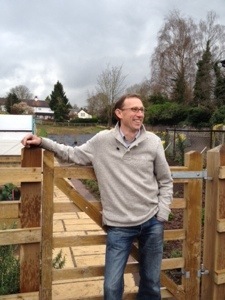 Combined with my amazing French friends I also had the joy of meeting Tim Shelley in Ross on Wye to see a community garden he leads as well as to hear about the ‘simple church’ he is part of. Tim shared about his experience of leading a largish baptist church to now leading a small group, who meet and get to know one another and simply share life. They don’t even have a bank account. A church or group without a bank account. Shhheeeech! This fact really did blow me away and while talking with Tim while I tucked into some fish and chips over lunch it really struck me that this guy believes in this stuff. So much so that they have such a basic set up without a load of paper work shaping what they do…a far cry from what I am used to and function with. As for my French faith inspirers… They have lived the last 11 years without any income or formal set up paying them. They don’t own a home. They have very little. They simply wait upon God to provide all their needs and find that people will send them gifts just out of the blue… I know I am part of an organisation that also does this, we live by faith but at the end of the day The light Project pays my salary. It feels easier to raise money for teams and projects and things than have that heart stompingly adventure of wondering if money will come in to feed the family and pay the bills. May everyday be one step more on the way of Simplicity: simplicity of faith. Simplicity of heart and simplicity of life. importance’ and entrepreneurial desires. The challenge for me is how do I live more simply in all aspects of my life and also be a pioneer, seeking to go where church isn’t and do what Jesus does.Surprise surprise, the inspiration in such questions is Jesus, the role model for many quandaries.He didn’t even have a home, or office with a laptop to blog on. So my prayer is, help me Jesus to walk simply with you, with my whole life.